Nigeria Captain Joseph Yobo will play in his sixth Africa Cup of Nations finals after making the final list of 23 released yesterday night by Coach Stephen Keshi. 10th FIFA World Youth Championship (now FIFA U-20 World Cup) in 1999, has previously played at the 2002, 2004, 2006, 2008 and 2010 finals, winning bronze on four occasions. Chelsea FC of England midfielder John Mikel Obi, 11-year veteran goalkeeper Vincent Enyeama and ace forward Ikechukwu Uche are also included. 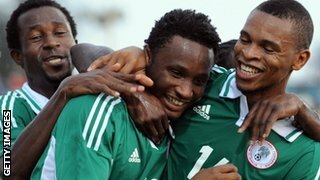 Apart from Yobo, goalkeepers Enyeama and Austin Ejide, defender Elderson Echiejile, midfielder Mikel Obi and forward Ikechukwu Uche who were at the 2010 Africa Cup of Nations in Angola, the rest are profile-on-the-rise and ambitious performers ready to captivate Africa. South Africa 2013 will be the first Africa Cup of Nations for goalkeeper Chigozie Agbim, defenders Kenneth Omeruo, Efe Ambrose, Azubuike Egwuekwe, Juwon Oshaniwa and Godfrey Oboabona, midfielders Nosa Igiebor, Ogenyi Onazi, Obiora Nwankwo, Fegor Ogude and Reuben Gabriel, and strikers Ahmed Musa, Emmanuel Emenike, Sunday Mba, Brown Ideye, Victor Moses and Ejike Uzoenyi. 2009 FIFA U-17 World Cup silver medal-winner Omeruo will celebrate his 20th birthday on January 17, the day the team will land in South Africa, while fellow defender Elderson Echiejile, a star of the FIFA U-20 World Cup in Canada in 2007, will turn 25 on the eve of Nigeria’s first game against Burkina Faso. Two-time champions Nigeria play Burkina Faso, Zambia and Ethiopia in Group C, with their first two games against the Etalons and the Cup holders coming up inside Nelspruit’s Mbombela Stadium on 21st January and 25th January respectively, before a clash with Ethiopia’s Walya Antelopes in Rustenburg’s Bafokeng Sports Palace on 29th January.